Seven years after the launch of NASA's Stardust spacecraft, its return capsule safely landed early Sunday in the Utah desert. The landing concludes a 4.6-billion-kilometer roundtrip journey to fly through the tail of a comet and collect dust samples, which astronomers hope will offer insight about the formation of our solar system. After the Stardust return capsule landed early Sunday in Utah, a helicopter crew placed it inside a protective covering and transported it via helicopter to a temporary clean room. Science team members plan to study tiny grains inside the capsule, collected as it passed through the tail of comet Wild 2. Images are courtesy of NASA/JPL. The Stardust spacecraft approached Earth early Sunday and, prior to maneuvering into orbit with the sun, released the return capsule and pushed it toward Earth. Four hours later, the capsule cruised through the atmosphere at about 45,000 kilometers per hour  70 percent faster than a space shuttle reentry and the highest reentry speed of any human-made object ever  and produced a large comet-like fireball that could be seen bolting across the sky from some of the western United States. "This thing lasted about half a minute, constantly getting brighter and climbing in the sky. And then we started noticing there was a luminous trail, this long trail behind it," said Don Brownlee, the Stardust mission principal investigator, at an onsite news briefing broadcasted in a NASA podcast. "It's ironic that you have a comet mission that ends producing a comet." 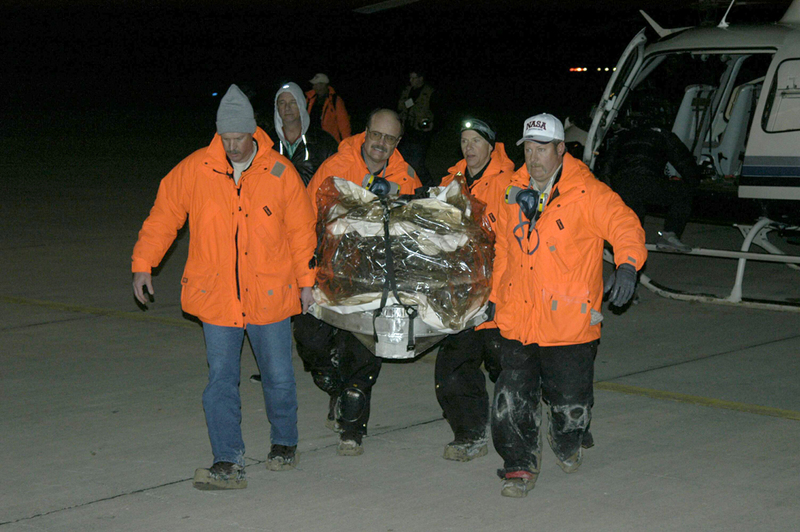 After touchdown occurred at the U.S. Air Force's Utah Test and Training Range, helicopter crews picked up the capsule, flying it to a temporary clean room at Michael Army Air Field, more than 100 kilometers west of Salt Lake City, Utah, where it awaited transfer to Johnson Space Center in Houston, Texas. "I kind of view this as we're on the 1-yard line," said Joe Vellinga, the deputy recovery operations manager, in the post-landing NASA podcast. "The real touchdown," Vellinga said, will be when the craft is opened and the science team finds out how many particles were recovered. That could happen anytime between Jan. 18 and Jan. 20, says Merrilee Fellows, a NASA representative. In the meantime, according to a Jan.16 Associated Press report, the craft appeared to be in "pristine" condition. The Stardust science team hopes to find more than 1,000 dust grains embedded in the gel-like substance within the capsule's collection grid, which resembles a large tennis racket. Those particles collected from the tail of comet Wild 2, most of which are smaller than a human hair, are the dusty remains of materials that scientists think formed the sun and planets in our solar system about 4.5 billion years ago. 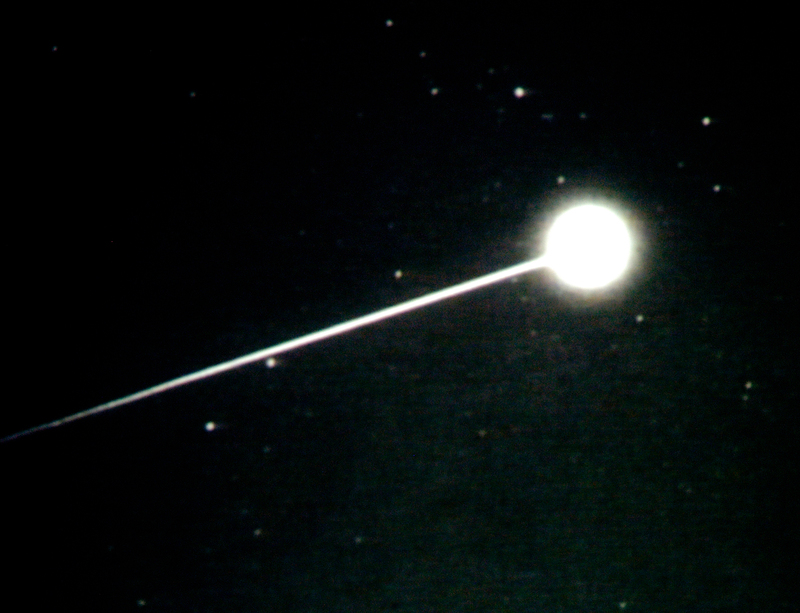 The Stardust capsule entered Earth's atmosphere with a streak of light, recorded here from NASA aircraft. Researchers will use the images to study the conditions during the fastest-to-date reentry of a human-made object. Study of the grains' composition for the first time in a lab might help astronomers figure out how elements came together to form the solar system. The team will also look to see if the gel captured interstellar grains from distant star explosions, which create numerous heavy elements that are necessary for life, such as carbon, nitrogen and oxygen. In other NASA firsts, the New Horizons spacecraft was set to launch this afternoon aboard the Atlas V rocket, en route to Pluto (windy weather conditions caused the delay of that launch, which was rescheduled for Jan.18, according to a Jan. 17 NASA press release). The first spacecraft to travel to the distant planet is part of a flyby mission planned to take a closer look at what surface features lie beneath Pluto's dense orange atmosphere, and to capture images of its moon Charon. Stay tuned, however, as the New Horizons spacecraft is not planned to make its earliest Pluto-Charon flyby until July 2015.